Picked this overdrive up from a good friend who likes his high-end gear. 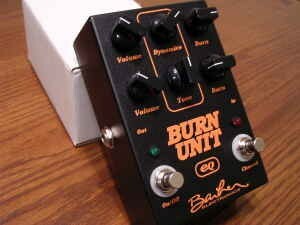 Fantastic pedal with two channels, so it turns a clean amp into a three-channel amp. I have channel 1 set for a slight, almost clean boost and channel 2 set for a little more hair. Both clean up really well with the volume control. Very transparent, doesn’t impose its character and keeps each guitar’s own sound. Sublime with my ’60 Les Paul Junior TV, itself an extremely nice sounding, powerful guitar.